1. auburn kicked some bama booty in the 2005 iron bowl. what was that matt elliott? fourth time in a row? why, that’s quite right! 2. i spent in a week in dallas for thanksgiving with my fabulous in-laws-to-be. two words describe the highlight of the week: hashbrown casserole. 3. over the holiday week, nick and i used those nifty scan guns (a patented product of my very own father! way to go, dad!) to register at a couple of our favorite stores: target and crate and barrel. 4. viginia tech deserves the 2006 ncaa football championship. go hokies. (since AU is “way down” at number 10 this year, i choose this way-better-than-a-number-five-ranked-team. they could beat usc, texas, penn st, and lsu if they played them all at one time.) not only do i believe this, but i am also scoring points with my fiancé by stating it. 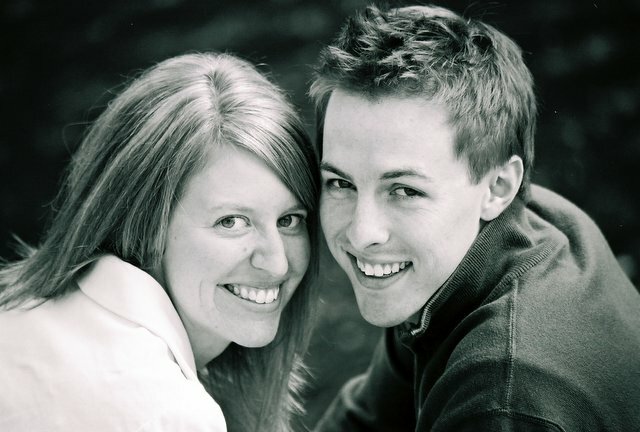 5. nick’s sister-in-law, angela faris, took engagement pictures for us! 6. reading update: i have given up on "searching for God knows what" for a while. i just can't get unstuck. "wuthering heights" is now the book that i read in small spurts when i'm waiting for trains to pass (which is more of a common practice in memphis than you might initially think). "second summer of the sisterhood" was finished long ago and made way for the third in the series: "girls in pants."